"BEST VALUE FOR THE MONEY/AMENITIES"
For sale a 3 bedroom 2 bath vacation Villa, fully furnished, granite counter-top kitchen, living room with flat screen TV and private upper deck/patio with grill. It is within a popular Boutique Resort surrounded by tropical gardens, with a refreshing pool, wet bar, BBQ area and gated for privacy and security. Located in Playa Hermosa, situated at the foot of the Hermosa Hills in Puntarenas province on the Central Pacific coast, it is the most famous surf beach in Costa Rica. It is also minutes away from Los Sueños marina which has one of the best sail/marlin fishing in the world. All the tours like zip lining, ATV, horse back-riding, fishing etc. can be arranged at the office of this resort. 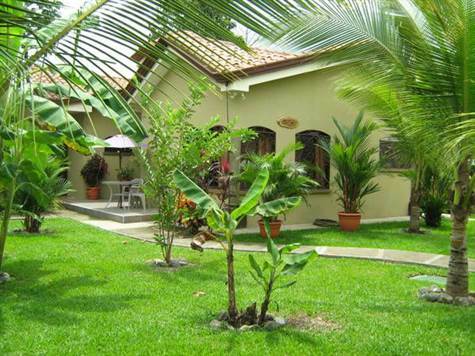 Ideal Vacation Home with excellent income from Vacation Rentals. Professional property management on site takes care of everything - rentals and property maintenance etc. Carefree and fun home to own!